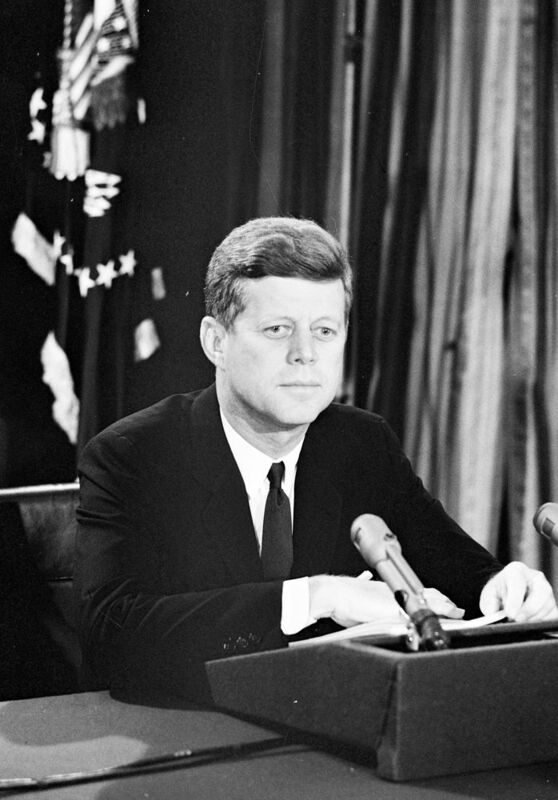 President Kennedy's televised announcement on the Cuban Missile Crisis, October 22, 1962. Robert Knutson, White House Photographs (WHP), JFK Library. I was just fifteen-months-old at the time, but my older siblings vividly remember President Kennedy’s televised announcement on the Cuban Missile Crisis on October 22, 1962, fifty-six years ago today. As did millions of Americans, my mother rushed out to purchase supplies to ready our basement-turned-bomb-shelter for five people. Our father would not have been among his four children and beloved wife in this inadequate refuge. In the event of a nuclear disaster, he would have dutifully evacuated his protectee, Vice President Lyndon B. Johnson. According to his daily reports, my father only spent four nights at home during the first three weeks of October 1962. It was the month before the midterm elections, as with current times, and Vice President Johnson was traveling across the nation to support his party’s candidates. At this time, my father was the Special Agent in Charge (SAIC) of the VP Detail, and Agent Jerry Kivett was the assistant in charge. These were the days when the vice president traveled with just two agents—or sometimes none at all. 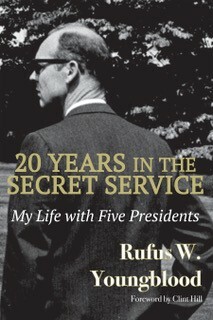 Secret Service protection for the vice president, by law, was provided “at his request,” and Vice President Johnson, with the taxpayers’ costs in mind, often opted to do without. But when President Kennedy began sending his vice president around the world on goodwill trips, a basic two-man detail had been created with Special Agents H. Stuart Knight as SAIC and Rufus W. Youngblood as his assistant. Yet, this detail was often canceled by Johnson when the annual budget hearings came around. Agents were transferred off and on this assignment until October 15, 1962, when President Kennedy signed an amendment into law assigning vice presidential protection to the Secret Service on a full-time, non-request basis. 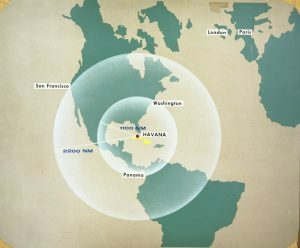 The Cuban Missile Crisis officially began the very next day when President Kennedy was shown images of missile sites detected on the island of Cuba. The president immediately began meeting with top-level advisors, a group which would be known as ExCom, short for Executive Committee, to debate the course of action. 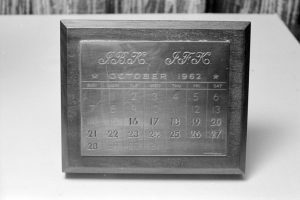 President Kennedy’s (JFK) gift to First Lady Jacqueline Kennedy (JBK) after the crisis. Cecil Stoughton, WHP, JFK Library. “I had noticed that LBJ was suddenly getting an unusual amount of telephone traffic from Walter Jenkins and other aides in Washington. He took me aside, his campaign smile gone and a serious look on his face. “Check the airlines and get us on the first thing back to Washington,” he said. ExCom meeting, October 22, 2018. Cecil Stoughton, WHP, JFK Library. 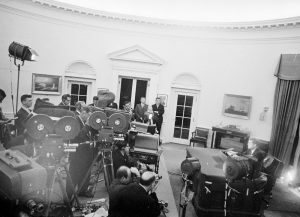 Television Address to the Nation on the Cuban Missile Crisis, 7:00 PM, Oct. 22, 1962. Cecil Stoughton, WHP, JFK Library. Anticipated missile destruction, Courtesy of JFK Library. At last, on October 28, the stalemate ended when the Soviets announced they would dismantle and remove the missile sites. Later, as negotiated with Russia, the United States quietly did the same with its missiles in Turkey. As I study this crisis some fifty-six years later, I am ever grateful that President Kennedy and his advisors found a peaceful resolution. On a personal front, I can’t imagine how difficult it must have been for the agents to leave their families to report to the White House knowing that they would not be able to protect their own families in the event of this disaster. I will continue to pray that our world leaders will proceed with extreme caution with their destructive weapons of war. The Cuban Crisis is one of those times in history that people remember where they were when it happened. I recall that I was in college studying for an important midterm German exam scheduled for Tuesday, October 24th. 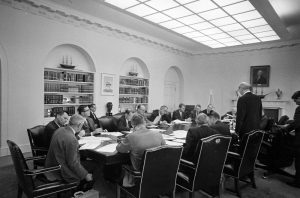 Following President Kennedy’s alarming speech to the nation that U.S. intelligence sources had detected the installation of medium-range ballistic missiles capable of delivering a nuclear warhead onto American soil, I wondered if I should waste my time studying for a test that I might never have a chance to take. Suddenly, the nation and I had other priorities. I learned several years later from my brother, Win Lawson, a Secret Service Agent assigned to the Presidential detail, that JFK had been in Chicago when he learned of the Soviet threat. Without warning, the President’s itinerary was abruptly cancelled because he had ‘developed a very bad cold’, requiring him to return immediately to Washington. As I recall, I took the German test and got an ‘A’, a grade that a grateful Nation would give President Kennedy and his Executive Committee (ExCom). Thank you so much for sharing this memory, Merlin. I can’t imagine thinking, “Will I be able to take a test or is the world going to blow up?” Indeed, I am grateful that President Kennedy was able to manage this crisis peacefully.